The technical department have years of experience in providing controls for a variety of hot water heating and pressurisation systems. We are able to offer either complete control systems or individual items to suit the customers requirements and the process. Economy - the more energy efficient a system, the more cost efficient it is to run it. Simple. GMS can provide complete control systems for various hot water and pressurisation equipment including control panel, control valves, actuators and sensors all pre-wired and pre-piped as standard to all of our packaged units (or can be supplied loose for safe transit and fitting and wiring to be completed at site by others). 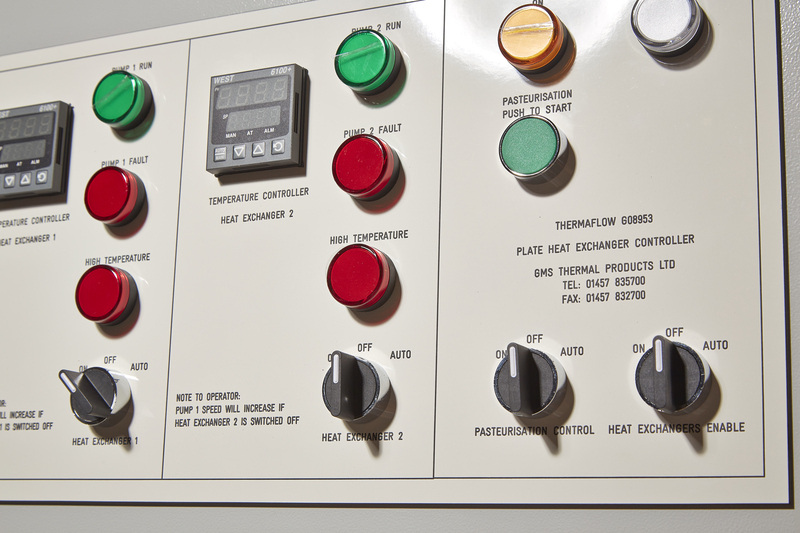 GMS Control Panels differ for each type of plant, however standard features typically include; Door Interlocked Isolator, Power on Lamp, High Temperature Lamp, High Temperature Re-set Push Button, Auto/Off/Test Switch, Volt-Free Contacts for Site BMS, Internally Mounted Isolator and Set of Control Relays. Additional features can be added on request, such as Pasteurisation. Wiring diagrams can be provided on request for all orders placed and our technical team are on hand to help with all control queries. GMS stock a wide range of control valves including 2, 3 & 4 Port Valves and are chosen depending on what the system requires them to do (throttling, mixing or diverting). A range of pneumatic and electrical actuators are also available. Our technical team are able to select and size the correct valve and actuator for the application. A wide variety of sensors and transducers are available for measuring pressure and temperature. GMS are able to cater to all requirements and provide the correct type of sensor for each individual application. Resistance Temperature Detectors (RTD's) are made up of an metal element (typically platinum), the metal has a predictable relationship between resistance and temperature. Therefore the RTD can convert the temperature change to a voltage signal by measuring the change in resistance of the element. Our standard RTD's have an operating temperature range of -50ºC to +200ºC (however other models can be selected with even greater temperature range if the application requires it). RTD's are steadily replacing thermocouples in many industrial settings due to their higher accuracy and repeatability. A thermocouple is made up of two dissimilar metals joined together. A voltage is produced when heat is applied to one of the joints, corresponding to the temperature difference between the two metals. However thermocouples are not as accurate as RTD's; temperature difference of less than 1°C are difficult to sense. Thermistors, unlike Resistance Temperature Detectors (RTD's), are made up of semi-conductor materials such as ceramic or a polymer rather than a pure metal. These semi-conductor material's resistance increases with temperature in a non-linear relationship and therefore are used for applications with a limited temperature change. Thermistors are less expensive than RTD's but are not as accurate and therefore only used in certain applications. If you would like any further information on our control systems or individual items, please do not hesitate to contact our technical department.